But it looks good though. For those that love tube dresses + recycling, you should love this. Step 1, 2, 3 & 4....Simple right? Chinco, you would have put up pictures of you trying it naaa! Anyways, good one. Ladies, just don't try this on your bobo's Christmas shirt o... Don't say I did not warn you o, heheheeee! OK na you go fear creativity. This is really nice for those who like tube dresess... I guess not for my girl sha. I won't allow her to be using my shirt for all these. Nice concept dear. How are you? I can't try o. Odikwa very risky, even tube they sew from scratch they fall not to talk of this. 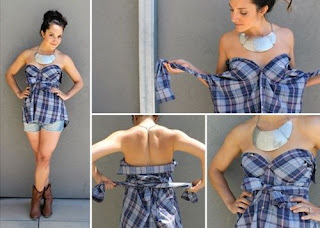 Really creative, I will try it some day. It looks simple but I don't think the practical is as simple as we thought. Nice one Chinco. Clearsthroat!!!! Females of today will misinterpret this to same as the males.... Well its creative though. Creative post - BTW , if you has been needing to merge some PDF files , my boss merged a service here altomerge. Would You Rock Any of This?